Pilsner is the quintessential Lager style. The Bohemian versions from the Czech Republic tend to be hoppier than the Bavarian versions from Germany. Cool Breeze Pils is an old-school Bohemian-style Pilsner perfectly suited to the summer season. 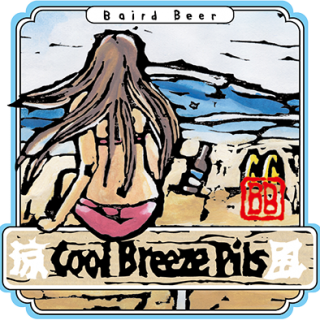 Cool Breeze Pils registers on the imbiber like a fresh ocean breeze does on the perspiring body of a mid-afternoon sunbather.’ Those were the words we used to describe Cool Breeze Pils when it was first released in 2001. The label is a depiction of these words. Our sunbather is a bikini-clad woman. Why? We like bikini-clad women and we don’t believe their association with beer should be only of the industrial variety. The kanji characters on the label stand for cool (涼) and breeze (風). Contemporary craft brewing takes its inspiration from traditional European brewing but also is a reaction against modern industrial brewing. Industrial beer, by and large, is a dumbed-down derivation of a traditional European Pilsner. Cool Breeze Pils is our idea of a pre-industrial, traditional, full-flavored European type Pilsner. 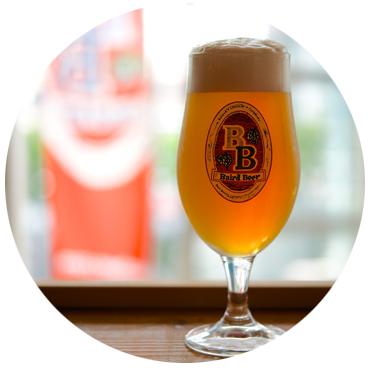 Cool Breeze Pils is a Bohemian-style, rather than German-style, Pilsner. This means more emphasis on hop character. We have been brewing Cool Breeze Pils as an annual summer seasonal since our first year of production in 2001. While I have tinkered with the recipe some over the years, at core nothing has changed. This is an old-school, decoction-mashed, non-filtered, naturally carbonated, brisk & refreshing version of the world’s most popular beer style.